This food hotspot is located a bit outside the Chiang Mai old town but is definitely worth a visit in case you're renting a bycicle, car or motorbike for the day. Although their prices are a bit higher than average (still not expensive in comparison to European prices), the quality of the food and drinks you'll get for it is simply incredible. We tried several dishes like their coconut sesame smoothie, nachos with guacemole, red and green smoothiebowls and quinoa pumpkin salad. Every single one of these dishes tasted perfect. As a dessert we had their vegan cheesecake which was so good. Make sure not to miss this spot because you won't get dissapointed! Snooze is a Bali-inspired, recently opened smoothie bowl cafe located nearby the east gate in Chiang Mai. The owner is one of the most friendly and welcoming persons we've met during our travel through Thailand, and his smoothie bowls are the best in town (among my favourites were the cacao peanutbutter bowl and the red fruit acai bowl - so yum!). Fresh ingredients, tasty fruits and delicious toppings: no need for more right? Snooze was my happy place for breakfast and lunch in Chiang Mai old town. Also make sure to try their avocado coffee because it is so incredibly good! Chiang Mai has a lot of sushi places, but AIKU Bar & Restaurant sure knows how to prepare good quality sushi. We tried some of their signature dishes like the AIKU sushi roll and scallop roll which were both delicious. Also their yoghurt-salmon fusion roll - although it sounds like a strange combination I know - was really tasty. 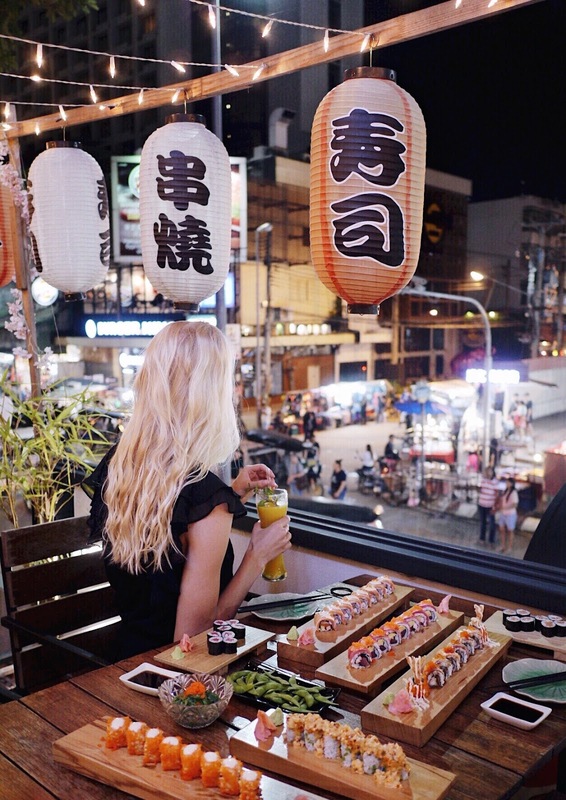 At AIKU it is possible to have dinner inside with aircon, but we preferred to sit on their rooftop terrace with atmospheric lights and cute lampions so we could overview the lively night market down the street. So in case you're in CM and seriously craving for some good sushi I suggest you visit AIKU! All of this food looks incredible! Almost too pretty to eat. Definitely bookmarking for the next time I go to Thailand!